Cal Flame offers the finest in gourmet grilling with this high performance Gourmet 5-Burner G5 Stainless Steel Gas Barbecue Grill that offers 1,000 sq. in. of cooking space. The G5 Grill has the cooking power of 75,000 BTUs. The G5 features five high-powered commercial-grade solid cast stainless steel burners emit 15,000 BTU each and features dedicated, independent, blowtorch ignition and control knobs. Gourmet Series 5-Burner Built-In Stainless Steel Propane BBQ Cal Flame offers the finest in gourmet grilling with this high performance Gourmet 5-Burner G5 Stainless Steel Gas Barbecue Grill that offers 1,000 sq. in. of cooking space. The G5 Grill has the cooking power of 75,000 BTUs. The G5 features five high-powered commercial-grade solid cast stainless steel burners emit 15,000 BTU each and features dedicated, independent, blowtorch ignition and control knobs. 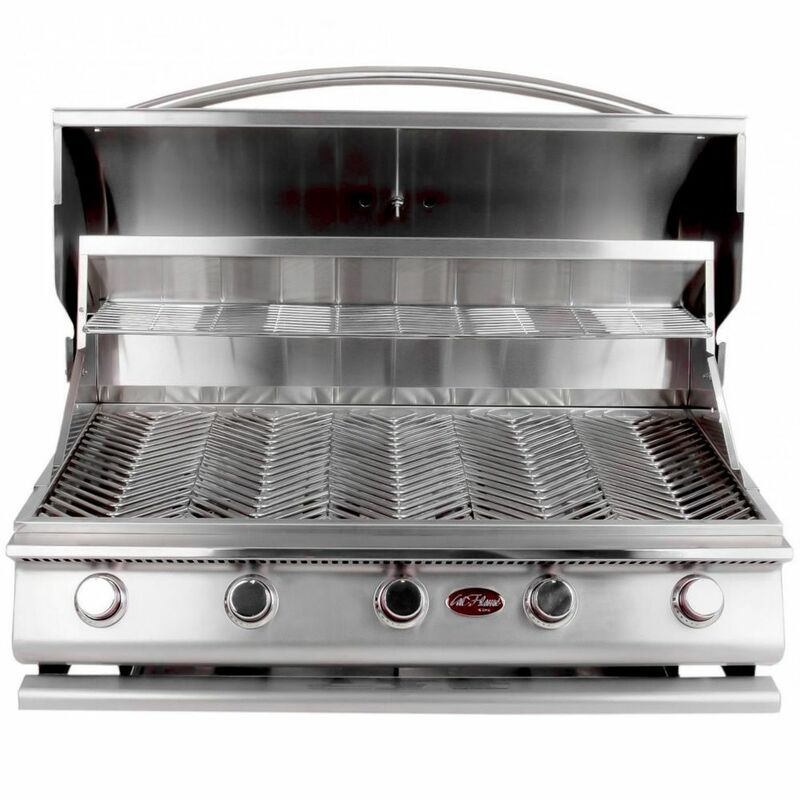 Gourmet Series 5-Burner Built-In Stainless Steel Propane BBQ is rated 3.9 out of 5 by 11. Rated 2 out of 5 by Ric from Though this was my 2nd purchase of the Cal Flame... Though this was my 2nd purchase of the Cal Flame G-5 it came with a handle damaged and it doesn’t work as well as the first one. I’m disappointed and after professional installation it would be impossible to return without additional expense. Rated 5 out of 5 by yubaguy from The grill was delivered in perfect condition, assembled, - on a pallet with all the components we... The grill was delivered in perfect condition, assembled, - on a pallet with all the components well secured. Burners fired up on the first try. On average I use my grill 5x a week. Oh boy, does it ever deliver heat!! Would recommend purchasing the sear burner accessory, and enjoy the juicy flavor and tenderness of meats. Bottom line, this 5 burner Cal Flame grill delivers everything as advertised. Rated 4 out of 5 by Lutie from Awesome grill Beautiful grill, just a little upset that it showed up with rust on some of the welds. Polished it off quickly. Rated 1 out of 5 by FredtheQguy from Horrible manufacturer support. Absolutely nonexistent customer service. Calls and emails to the manufacturer go unanswered. Good luck finding replacement parts. Rated 5 out of 5 by Laurie from Impressive buy! This grill can do it all! It's perfect for outdoor parties, a large assortment can do on this grill without a problem. Clean up was easy and it looks great!